Plans to raze the rustic Main Street Theater and develop 103 apartments on the building’s Excelsior District site are moving forward, with the project team having applied for priority processing. 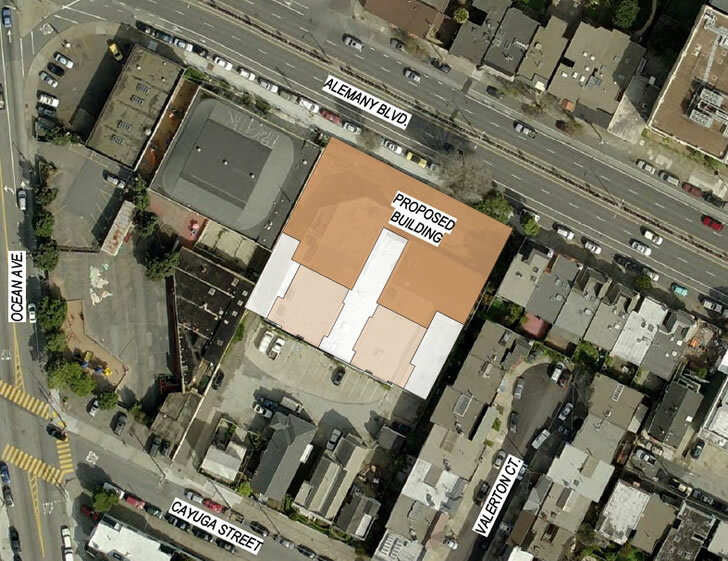 As we first reported last year, the proposed development would rise up to 40 feet in height across the 915 Cayuga Avenue parcel which extends to Alemany Boulevard, behind the Little Bear School campus at 65 Ocean Avenue (a parcel which is being redeveloped as well). The development would effectively front Alemany, with its garage entrance for 103 cars accessed via the existing curb cut on Cayuga. 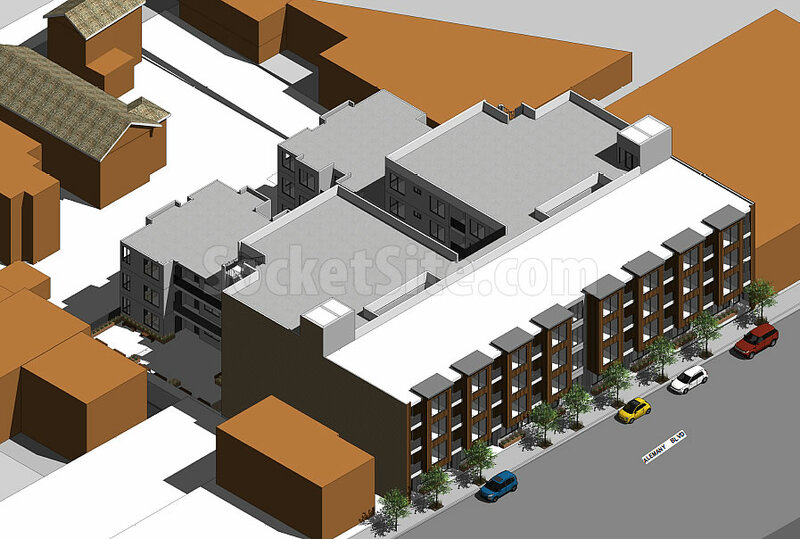 And as newly proposed, half of the 103 apartments would be permanently rent controlled while the other half would be offered at below market rates, possibly serving as the required off-site inclusionary housing component for another neighborhood development (or two). Zero ground floor retail? 1:1 parking for rent-controlled/BMR housing? Alemany has never had much retail. That’s not to say it shouldn’t have retail, just that it hasn’t had it in the past. That is not in the Excelsior District. It’s literally one block away from mission street, which is the western edge of the excelsior district…hate to break it to you, but neighborhood boundaries are kind of nebulous, and many people are going to refer to this building as being within the excelsior district, because of that, including many people who live there. There will be others who refer to it as Mission terrace instead, or the outer mission, and probably some other names too. It’s about five blocks from the district’s namesake, Excelsior Ave. Even if not technically within some arbitrary boundary, it’s certainly close. Well then I guess Tijuana is in The United States. Is this the part of Cayuga Ave that floods with raw sewage with every storm? No. That’s a mile away. That part of Cayuga is down by Glen Park, between (about) Lyell and Rousseau. Though individual houses farther west on Cayuga also can have their share of problems. See solutionsnotsandbags.org for the neighborhood organization that’s trying to fix it. I placed on offer for 201 Cayuga. Thank goodness I didn’t win. 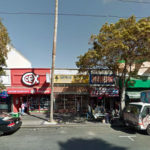 To bridge and connect the mission corridor to ocean ave and the balboa station, this building along with the other project around the corner, both need a retail ground floor component. Don’t think this is a great place for ground floor retail – there is no retail on Alemany except for the gas station and service station on the corners of Ocean, so there isn’t much foot traffic to entice store owners. I think we’d be better served filling in the many vacant storefronts on the nearby stretch of Mission than trying to add new retail with little to support it. I know the retail stores on Ocean between Alemany and San Jose have struggled mightily. Not sure I like the driveway on Cayuga – its a very small street, but admittedly it would be easier to enter/exit than Alemany. Look forward to seeing more info.. Does anyone know what will happen to the Moving Arts Studio?